Udforsk Pompeji og Mt Vesuvius på en firehjulstræk tur for et nærbillede af denne italienske vulkan. Rejs op ad bjerget i et 4x4 køretøj til Vesuvius National Park, hvor du vil gå til krateret for at lære om dets geologi og overvågningssystem. 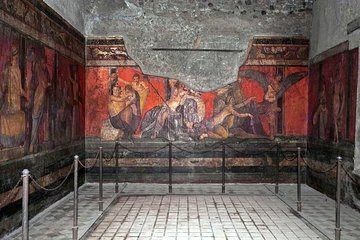 Så besøg de arkeologiske ruiner af Pompeji, et UNESCO World Heritage Site, hvis udgravninger afslører, hvordan livet var ligesom lige før Vesuvius udbrud og dækkede den gamle by med sin dødbringende strømning. Het bezoek aan Pompei was oké maar ook niet meer. Zo werden enkele highlights vermeden omdat er blijkbaar te veel volk stond aan te schuiven. Vervolgens werd de optie 'Vesuvius 4 x 4 voertuigen' zonder uitleg uit dit programma verwijderd. Ook was er tussen het bezoek aan Pompei en de tocht naar de Vesuvius geen mogelijkheid voorzien voor een korte lunch. Bovendien moeten wij hier signaleren dat tijdens de busrit van Sorrento naar Pompei en terug, de bestuurder voortdurend handsfree belde met zijn mobiele telefoon. Iets dat tijdens de hele rit erg verontrustend was. Merk op dat niet alleen wij twee deze opmerking hebben gemaakt. The Pompeii Ruins were very interesting and the guide was informative. Would not want to tour the Ruins without a knowledgeable guide. Vesuvius was amazing - The last hour walk up to the crater was a nice workout and afforded us beautiful sites from the mountain. The car that picked us up was clean and the driver courteous - we went to Pompeii first and had 2 hours guided around by Lucia. Lucia made the whole site come alive - she was enthusiastic and clear and knowledgeable. We got back in the car to go tp the car park at Vesuvius ready to walk up the final section. It would have been great to either have been taken to somewhere to eat/pick up some food or been told to bring some food with us. I had a banana between pick up at 9am and drop off at 4pm. There is a small café for drinks/chocs/crisps on Vesuvius but not really sufficient for the exertion/length of the day. Did not connect with a guide at the top of Vesuvius, I guess I could have missed them? Due to heavy traffic I would probably go from Sorrento to Pompeii by train another time but would definitely hire a guide at Pompeii. What I learnt from Lucia at Pompeii meant I understood and got so much more from the trip I made independently to Herculanium. You can take a coach from Pompeii to Vesuvius with ease - not eating really affected the day - I had a banana in my rucksack - thank goodness! The tour was excellent and our tour guide Vivianna and bus driver Alberto were really friendly and helpful. Mt Vesuvius is amazing and the views spectacular. Unfortunately, our guide and driver were very unorganized and we arrived late for the shuttle that takes you near the top of the volcano. We wasted valuable time that cut into our experience at Pompeii later in the day. You need to walk the last 0.5 miles up to the top of Vesuvius but the path is very safe. Being at the top of Vesuvius was one of the highlights of our trip to this part of Italy. We had a nice lunch near the entrance to Pompeii and it was included in the tour. Pompeii was fantastic but our time was short due to delays earlier in the day. Our guide was very knowledgable about the site and he provided important information about the history of Pompeii. Our group stayed in Sorrento and the shuttle bust picked us up at the hotel, drove to Vesuvius and Pompeii and returned at the end of the day. That was very convenient. It would have been a perfect day except for the initial delay in getting started. This would have been a lot better had the poor tour guide not had to translate everything she said and there was a lot of it! into two different languages. This made it all very slow going not to mention hard for her, I'm sure and some of the younger members of the tour got very bored while we were standing around waiting. The thing is, Pompeii is massive, so there's no time to go wandering off on your own, meaning we had to stay within the group. The 4 x 4 side of the tour didn't happen. We took the coach up and walked the rest of the way to the summit of Vesuvius, so not sure what that was all about. That said, we still had a great day. Wear comfy shoes and take plenty of water if you're climbing Vesuvius - you'll be glad you did. This was a fantastic tour. There were only 5 people including myself and the other 4 people were spanish so the poor tour guide had to speak spanish to them and then english to me but that was not a problem. Our pompeii tour guide was fantastic and the 2 hours flew by. The only critic I have is the advertisement of the 4X4. Through reading reviews I had noticed they were not using 4x4's but a van. I had to reach out to the company and directly ask them and they confirmed due to a fire that a van is used instead. Personally as a consumer I should not have to reach out and ask these questions - the advertisement should read the actual title as I choose this tour over others because of the 4x4. Due to being end of season I had to keep the reservation but no discount was given to which I think should be. The next bookings are from March 2018 so contact the company beforehand to check the 4x4's are operational. Overall the tour of Pompeii was great! The guide was informative and entertaining, even suggested a great little winery to stop at for lunch. The ruins are a must see if you're in the Naples area! We were slightly disappointed in that we got placed in a small van vs. the 4x4 for Mt. Vesuvius. However, the walk up/down to the volcano was fun and the sights on the trail were amazing. Both Pompeii and Vesuvius are must do's in Southern Italy and this tour was a plus during that adventure. I had a wonderful time on this tour. They offered hotel pick-up, the driver was very nice and I really liked our tour guide, who could be a bit comical at times. It was very hot on the day we went, but the guide managed to keep us out of the sun most of the tour and still saw some amazing stuff. The guide spoke English and was very informative and the group for the tour was small, which was nice. The 4x4 portion of the tour, of Mt. Vesuvius was cancelled due to wildfires, I was a bit bummed about that, but that was out of their control. The tour was too quick. We felt that we did not see enough of Pompeii. The crowds were not monitor. Our guide did not care if folks left the tour and wandered. Tours were not like they were 20 years ago. Vesuvius was remarkable. Stunning and not enough time for those who took a slower time to get to the top and wanted to spend more time look around.